Rattlesnake is an heirloom pole bean variety that is known as a good producer in areas with hot, humid summers. That pretty much describes the summers here in the southern part of the Ohio Valley where I garden, so it sounded like a good variety for me to try. It is popular in the southern U.S., where it is sometimes called Preacher Bean. This is my first year growing this bean, but based on its showing this year I certainly plan on growing it again. Rattlesnake is a ‘dual purpose’ bean that can be used as a snap bean when the pods are young and tender, or left to mature for dried beans, which resemble a dark pinto bean. I got my seeds from Baker Creek, which has a good photo of the dried seed in their online catalog (as does Southern Exposure Seed Exchange). I neglected to get a photo of my seeds before planting. The markings on the pods are said to resemble a rattlesnake skin, though to me that is somewhat of a stretch. Other sources claim the name refers to the markings on the seeds. Regardless of how it got its name, the Rattlesnake bean has green pods that are mottled with purple markings that disappear when cooked. The color makes them relatively easy to find amongst the foliage. The first pods appeared this year about 55 days after a late May sowing. The pods start out flat and narrow, and at this stage they are very tender, tasty and completely stringless. We enjoyed a couple of harvests at this stage before I left the rest of them to go for dried beans. The blossoms are purple, and the vines are long and vigorous. I grow my pole beans on a trellis using Hortonova netting material. You can read how I put up the trellis here: Trellising the Pole Beans. If left on the plant, the pods start to fill out fairly quickly. As the pods mature they will develop reddish maroon markings and then eventually begin drying up. Our summer weather is so humid that it is difficult to let beans dry outside on the plants without them rotting, or even sprouting. So I try and harvest the pods when they are mature but not fully dry, and then shell them and let them finish drying inside. 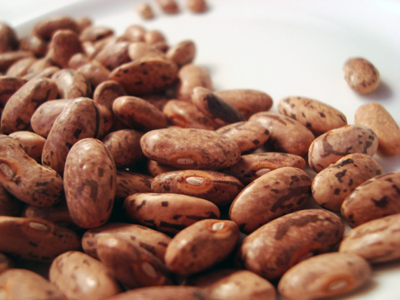 Each pod usually contains from 6 to 8 beans. They should darken as they dry so they more closely resemble the original seed stock. They do look much like a pinto bean, and I am anxious to see how they taste. I hope you’ve enjoyed this Saturday Spotlight, and I’ll be back soon with another variety. This entry was posted in Saturday Spotlight and tagged dry beans, pole beans. Bookmark the permalink. A great looking bean! Thanks for the info. We made our first attempt at growing a “shelling” type bean last year with only limited success. I’m looking forward to trying again next year! What a beautiful bean, but it sounds like it would not like my cooler drier (except when it’s foggy) climate. I’ll just have to admire your beauties. They look very beautiful indeed. I’m always on the look out for good varieties of climbing beans. Apologies I didn’t write a post this week. I linked to you in my Monday Harvest post and also in the Index. I will try and write a spotlight next week. I tried those one year. I should have tasted them as green beans, but never did. They did produce very well.